WAIST HIGH: The USGS Has NOT Approved This Message. 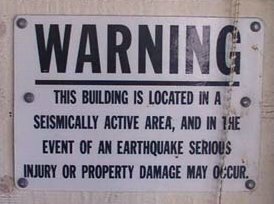 The USGS Has NOT Approved This Message. Since this whole volcano extravaganza began, it has been frequent that Waist High has been present for conversations that have ended with: "Well...we ARE in The Ring Of Fire." So, Waist High was thinking that today she would take a break from insulting various family members and return to a time when she prided herself on trying to educate the public. (news.bbc.co.uk) The zone - the 'Ring of Fire' - notorious for frequent earthquakes and volcanic eruptions, coincides with the edges of one of the world's main tectonic plates. In the past 25 years, scientists developed a theory called plate tectonics explaining the locations of volcanoes and other large-scale geologic features. According to tectonic theory, the surface of the Earth is made up of a patchwork of massive rigid plates, about 80km thick, which float in slow motion on top of the Earth's hot, pliable interior. The plates change size and position over time, moving at speeds of between 1cm and 10cm every year - about the speed at which fingernails grow. New sea bed is constantly being created in the middles of the oceans - flowing out as hot lava, and rapidly cooling on contact with cold deep sea water. To make room for the continual addition of new ocean crust, all the earth's plates move. And as they move, intense geologic activity occurs at the plate edges.